A beautiful sunset paddle in Tivoli Bays. I will not ruin the mood by saying too much, but what a gift to see such a beautiful sight. 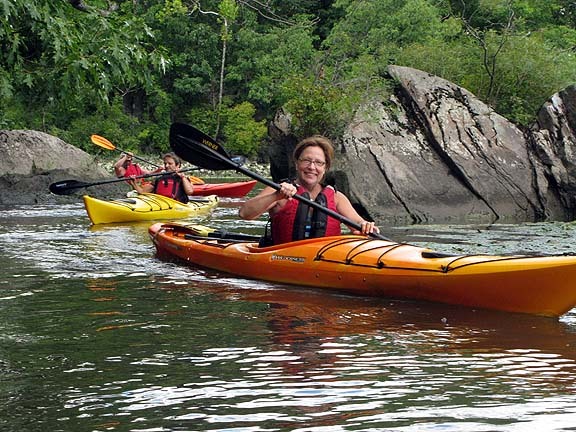 During a recent trip to Tivoli Bays guests navigate past large rocks. One of our favorite places to take our guests is Tivoli Bays. We get to explore the winding marsh area before traveling under the railroad bridge into the Hudson River. Just before the bridge the bay opens up and gives an amazing view of the Catskill Mountains. It’s quite breathtaking. Once out into the river we work our way around the two islands, Cruger and Magdalen. Usually we are treated to the sights of Bald Eagles, Great Blue Herons and White Egrets. Some where along the line we find a nice place to beach our kayaks and enjoy lunch. And maybe get a swim in too. 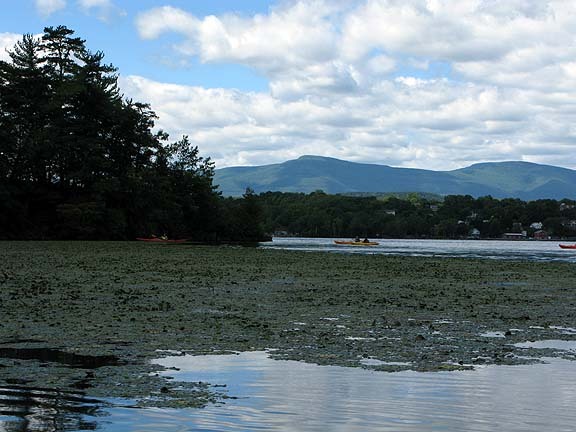 The Catskill Mountains backdrop the bay. After a healthy lunch we work our way along the islands and the railroad tracks back toward the marsh. Right now the Cardinal flowers are in full vivid bloom. It you haven’t got out to enjoy the bay yet, contact us. We would be happy to share the beauty with you. 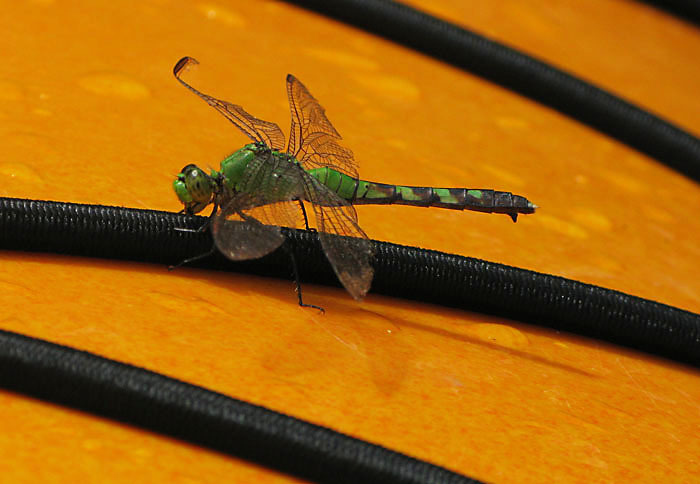 A dragonfly hangs onto the rigging of my kayak. Sorry that it has been a while since the last post. We have been cranking this summer and I have to admit, if it is a choice between blogging or paddling, well you get the idea. It has been a great summer, perfect weather, warm water and lots of sun. I for one am not ready to say it is over yet. It is true that the days are indeed getting shorter, but I am holding on like the dragonfly above is holding on to my boat. 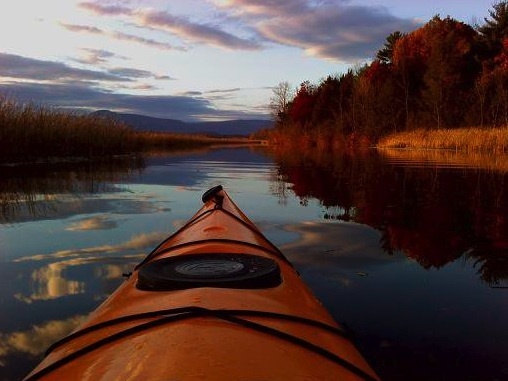 We are hoping to paddle well into October, so don’t give up yet. The Esopus Meadows lighthouse during a light rain shower on the Hudson River. Showers in the forecast? No worries, as long as thunderstorms are not predicted. I have to say, there is no more peaceful paddling on the Hudson River then when it is raining. The gentle burbling of the raindrops hitting the water, cooling you off in the summer heat. It also seems to have a calming effect on the wildlife, which allows you to get a little closer for photographs. Speaking of photos, the light during a rain gives dramatic effects to photographs. The soft light saturates colors and enhances mood. 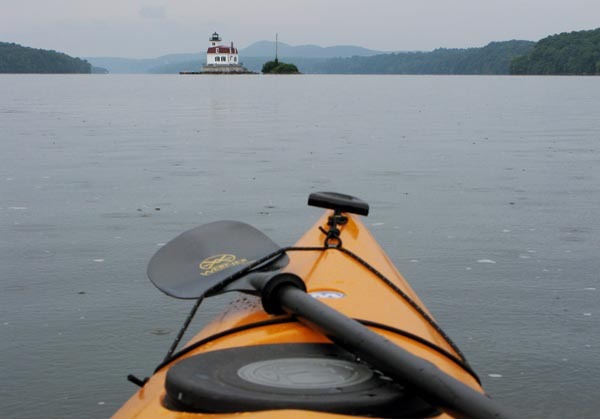 The shot above of the Esopus Meadows lighthouse is a great example of photography in the rain. So don’t put off that paddle if there is rain predicted, enjoy it. It’s summer, some say the dog-days of summer. We have been keeping a close eye on the weather, and with careful planning, have been getting plenty of time out on the water despite the stormy wet weather. On Wednesday we got out and played in the gentle waves produced by the out-going tide and our more friendly wind from the north. Just after loading up the boats, around 8pm, a rain storm came through producing a beautiful rainbow off to the southeast. Dog star, Sirius? It’s the star, brightest in the sky this time of year. It is also where the phrase dog-days of summer comes from. Check it out at EarthSky. 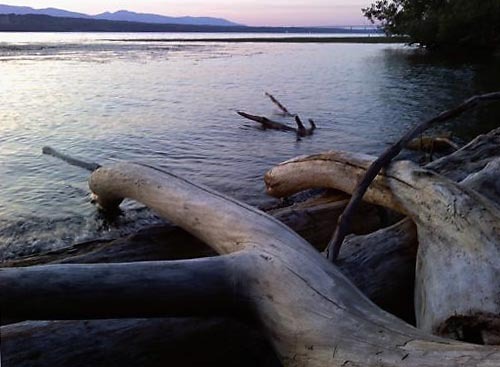 A great way to cool down..
Piles of driftwood line the eastern shore of the Hudson River. After a hot day in the office, mowing the lawn, or whatever has you heated up, there is no better way to cool off than taking an evening paddle on the Hudson River. There is cool breeze that comes off the water that is refeshing after the hot humid winds from earlier in the day. You can dip your arms in the water, even take a swim if you like. Mmm, it’s so soothing. There is always so much to see. Last night just as the sun set below the Catskill Mountains, I was sitting in a small cove when I spied an otter playing in the water. At first I thought it was a large eel, but sure enough the curious animal turned out to be an otter. What a treat. A couple of things to keep in mind when going out in the evening: Be particularly aware of the motor boat traffic; make sure you bring a white stern light in case you get caught out after dark; stay close to shore where powerboats can’t go after the sun goes down, you’re much safer there. Oh, and always, have fun! Support one of the organizations the protects our Hudson River. Come out on June 19-20 and listen to great music at Clearwater’s Great Hudson River Revival. These folks put a lot of time and effort in to educate, protect and care for the Hudson. What a great way to show them a little love.